Is Microsoft preparing a futuristic 'translucent aluminum' smartwatch? Microsoft is prototyping a smartwatch and that development has now gone under the Surface team as the company transitions to a more unified structure, according to inside sources speaking for The Verge. This move allegedly shows how serious Microsoft is about the smartwatch form factor and that it is moving it towards completion. Earlier, the smartwatch was developed by the Xbox accessory team along with the Joule heart rate monitor. We have previously heard that Microsoft has placed orders for 1.5-inch displays and will be using the Surface magnetic connector in the possible upcoming smartwatch. The Microsoft smartwatch will come with removable wrist bands and color options for them will include blue, red, yellow, black, white, and grey colors. What’s most interesting is that the actual watches are made out of Oxynitride Aluminum, an expensive material described as "translucent aluminum" that is also three times harder than glass. 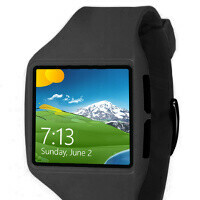 Right now, reports claim the Microsoft smartwatch is using a modified Windows 8 and features 6 gigs of internal storage and LTE connectivity to connect it to the cloud. The watch is said to also serve notifications and allow access to music controls. Awwwwesome! A smartwatch for WPs finally..
We do need it actually. For bragging rights. /s Just wait for iWatch to be released, their fans will do the same. Gotta be a watch fan to appreciate i guess. For me, its pointless, all of 'em. But i don't and have never worn watches to begin with. This has to happen eventually, if other competitors are doing the same. Nothing surprising. Unless a holographic screen pops up, I'll prefer wearing my old mechanical watch from the Soviet Union. Watches are for looking at the time, they should not be an extension of my smartphone, otherwise I'm going to be more distracted more than most ADHD patients. So watches and glasses are next for us, hope they'll be useful and offers good stuff. NO release dates? I love this one. What exactly does a smartwatch do that a smartphone can't? good on ya guysss. bring it on.